One Bright Jewel, or sometimes translated “One Bright Pearl” is a short but important fascicle of Dogen’s Shobogenzo – a thirteenth century manuscript. Dogen had a 5 year break from writing on the Shobogenzo which, when completed had 95 independent essays. This break from 1233-1238 took place when Dogen was starting his monastery, Kosho-ji, and naturally, amidst all the work of starting a monastery and establishing monastic order, he didn’t have time to write. But in 1238, when he started to write essays again, “One Bright Jewel” was the first writing. Okumura-Roshi’s translation changes pearl into jewel. Okumura Roshi is the only translator that doesn’t use or like the word “pearl” He has given some important reasons why. The first reason is that a pearl has a color – white, and when you put a white pearl on another color, there is a separation – a white sphere against the other object’s color. Okumura prefers to say it is a transparent jewel that takes on the color of its object. So if you put the transparent jewel on the brown table cloth, for example, the jewel becomes brown. If you put it on the flower, it becomes fuchsia color. This transparency is the key to a metaphor of oneness. The jewel unites or becomes one with whatever object is arising. The second reason is our attachment to pearls and their beauty. I did have a bit of resistance because I love the title “One Bright Pearl”, which I am accustomed to. We have an attachment to the poetry and beauty of the pearl. My mother made sure I had pearls by the time I was 18. This attachment, of course, becomes a hindrance to the meaning of the fascicle. The last and perhaps most convincing reason is that if you call it a jewel it joins a whole lineage of jewels in the Buddhist pantheon. It is actually the same as the mani jewel which appears in the Lankavatara sutra, The Complete Enlightenment Sutra, and the Shurangama sutra. 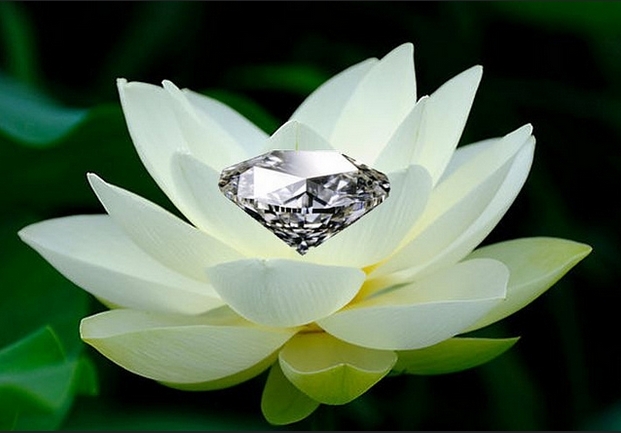 The metaphor of the mani-jewel is used in many different ways; the jewel at each intersection point in the network of Indra’s net, the pinta-mani of Jizo- the wish-fullfilling jewel, a medicine jewel, etc. If we use the translation of one bright pearl, we disconnect from this long history in Buddhism of symbols of the bright jewel. To accept all conditions as one bright Jewel. One Bright Jewel becomes the refuge for us if we understand it deeply. Our spiritual life should provide a refuge place for us. Katagiri-Roshi called it spiritual stability in the midst of the ups and downs of life. Spiritual Stability is developing an unshakable equanimity in the face of the worldly winds. The winds of our worldly desires are blowing constantly and sometimes with gale force winds. The ordinary mind goes through life attaching to the left side of the chart – all the positive qualities. We push away the negative qualities of pain, loss, failure, and criticism. The positive qualities are what we wish for and consider the jewels. The negative qualities, usually, we consider the dregs – definitely not jewels. But in Buddhism, if we have a deep enough understanding, we change the basis of operation in our minds and learn to accept both sides of human life and its accompanying stories as the Bright Jewel itself. Any condition is the One Bright Jewel. All conditions manifest the miracle of life. In order to have a deep enough understanding to accept all conditions as One Bright Jewel, we have to have a relationship with unconstructed reality. In our ordinary minds, we don’t have any idea of what an unconstructed reality would feel/look like and we hold on to the appearance of reality and our stories. As we begin to practice meditation, we are able to have an experience of something that is much larger than our personhood and our personal story. The Heart Sutra, which is chanted everyday at a Soto Temple, are words to help us have even a small insight into what unconstructed reality or sunyata or emptiness might be. It ends with the mantra: Gate, gate, paragate, parasamgate, Bodhi, Svaha. Through meditation we can sometimes taste a state of mind that is non-thinking. The waves of our mind will simply calm down by their own accord or by our deep efforts to have single-minded thought. Sometimes in meditation we can feel the insignificance of our personal identities and stories and tap into our sense of ourselves as a larger body, interconnected with everything and not alone. A sense of no centralized self. And lastly, we can start to realize that our concepts about time are just that – theoretical concepts. Our sense of time is constructed by our minds. Another way of starting to feel unconstructed reality is to contemplate the Eight concepts and the Eight “no’s” which I have found in Thich Nhat Hanh’s writing. We can see that the Eight Concepts are constructed by our thinking process and are divided by dualism. The Eight “no’s” are the deconstruction of that thinking process. They are very similar to the “No’s” in the heart sutra. No eyes, No nose, No tongue, No Body, No mind. In order to find a true refuge place from the winds of the world, we have to find this place of “no.” The Bright Jewel is your original face – our Buddha Face, the face before your parents were born. What is that? However, this “no” is not separate from the form of our self and our story. They appear together and this is the investigation of this fascicle. How can we understand the bright jewel as the dynamic working of the essence of life and the form of the moment. With this understanding we can live our life with awakened awareness in this very moment and at the same time carefully take care of the karmic conditions that are arising in this moment as well. Take care of and accept all conditions as One Bright Jewel.